An excerpt from my notes (including a misspelling of “repetition”) taken at Alexei Kitaev’s seminar during his first visit to Caltech in 1997. That was a very exciting day. In 1997, I had some disposable funding as part of a quantum computing project, and decided to seize the opportunity to bring an interesting visitor to Caltech. But whom to invite? Chris Fuchs, then a postdoc at Caltech who seemed to know everybody working on quantum computing, reported that Richard Jozsa, while attending a conference in Japan, had met a remarkable Russian from the Landau Institute named Alexei Kitaev. Responding to this tip, I found a paper by this Kitaev fellow on the arXiv … and was amazed. Later, Alexei told me the story behind this paper. When Peter Shor discovered the efficient algorithm for factoring numbers on a quantum computer in 1994, Alexei heard rumors about the discovery but was unable to attain a copy of Shor’s paper. So he independently invented his own algorithm, which was in some ways similar to Shor’s, but solved a more general problem! From reading this paper, I was confident that Kitaev would be an interesting visitor. Having learned (again through Chris) that Charlie Bennett and David DiVincenzo were also interested in meeting Kitaev, we arranged to co-sponsor his trip from Russia, with Kitaev splitting his time in the US between IBM and Caltech. My expectations were high, but not nearly high enough. 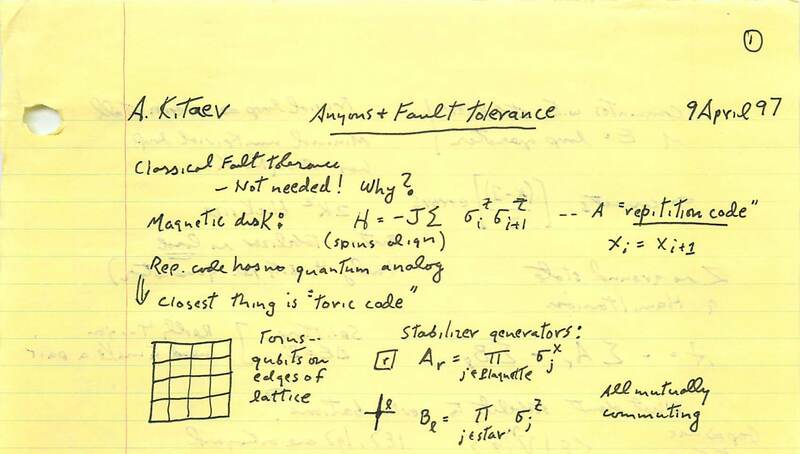 On his very first day at Caltech, Kitaev told me to call him “Alyosha” (which I later learned should be spelled “Alesha”), and started explaining one of his most marvelous ideas — using non-abelian anyons for fault-tolerant quantum computing. At that time, non-abelian anyons and fault-tolerant quantum computing were two different topics that I already knew a lot about and found very interesting. Yet it had never occurred to me that these two topics were at all related! By the end of the day I understood the connection and I was hooked. Over coffee at the Red Door Cafe that afternoon, we bonded over our shared admiration for a visionary paper by Greg Moore and Nick Read about non-abelian anyons in fractional quantum Hall systems, though neither of us fully understood the paper (and I still don’t). Maybe, we mused together, non-abelian anyons are not just a theorist’s dream … It was the beginning of a beautiful friendship. Kitaev’s idea was simple, obvious, and beautiful (the great ideas are obvious in retrospect, but only in retrospect). Anyons are exotic localized particles in a two-dimensional medium. Kitaev understood that a system supporting anyons has many distinct quantum states with nearly the same energy, yet all of these states look essentially identical when we observe their local properties. That’s just the feature that a quantum system should have for its quantum state to be well protected against the damaging effects of noise. Furthermore, we can process the quantum information stored in this manifold of degenerate states by exchanging the positions of the anyons, thereby operating an intrinsically robust quantum computer. We’ll go more deeply into the status of this idea, and its prospects for experimental realization, in later posts. While Alexei Kitaev was studying physics at the Moscow Institute for Physics and Technology in the mid-1980s, another physics student named Yuri Milner was studying at nearby Moscow State University. Yet they never met until Yuri called to inform Alexei that he had been selected as a recipient of the newly established Fundamental Physics Prize.Yuri hopes that this prize will draw greater attention to the excitement and value of basic science, and inspire young people to pursue scientific careers. All of this year’s recipients are brilliant scientists with spectacular accomplishments. Congratulations to them all, but especially, congratulations Alesha! This entry was posted in News, Reflections, Theoretical highlights by preskill. Bookmark the permalink. I am a theoretical physicist at Caltech, and the Director of the Institute for Quantum Information and Matter. Follow me on Twitter @preskill. I enjoyed reading your post. That was a wonderful time when we were all discovering the new quantum world. I also remember a nice conference in Torino in the summer of 1997. There we discussed whether the Universe could be a fault-tolerant quantum computer, hiding the information loss in all but special cases, like the Hawking radiation. Now I tend to agree with you and Horowitz and Maldacena that the information is not lost at all, but the black hole paradox is still a mystery (at least, to me). Yeah, we were roommates in Torino in ’97, but I always went to bed before you. I assumed you were staying up late because you were typing your paper about anyons in the computer room (few of us traveled with laptops back then). I smell a Quantum Times article. Alesha? John? Maybe we can just reprint this blog post? John has my e-mail if you want to discuss it offline. I hope Yuri Milner ends up supporting the CONSTRUCTION of Alesha’s dream. It would be un grand et beau geste for the world and Russia. Thanks, Joydip. As you note, Kitaev’s 1997 paper discussed two related ideas — using surface codes (systems supporting abelian anyons) for robust quantum memory, and using systems supporting nonabelian anyons for both robust quantum memory and fault-tolerant quantum computing. Both are great ideas and have had a huge impact on quantum computation research. I think the nonabelian version was the deeper and more original idea, but surface codes might wind up being more useful for future quantum technologies. My reading of the prize citation is that the proposal to exploit nonabelian anyons is being recognized, but that’s not completely clear. Actually, both ideas are quite timely, in view of the evidence for Majorana fermions in quantum wires reported this year by the Delft group, and the recent excitement about realizing surface codes using superconducting circuits (e.g. work by the UCSB and IBM groups). Let me congratulate Alexei Kitaev many times for this highly deserved prize! His research has had a deep impact on my research interests within theoretical physics. I remember when I as a undergraduate student discovered his papers on the K-theoretical classification of topological insulators, the Kitaev model on honeycomb lattice, the 1D majorana model and so on. They had quite a influence on me and I have learned a lot from them. I am still amazed by Kitaev’s ability to consistently put forward highly original and influential ideas. I am a little worried about the construction of the Fundamental Physics Prize. Since the winners of this year has to choose the next winner and this is know in public, couldn’t they risk others will try to influence them and treat them differently if they think they have a chance to win? And if somebody close to the current laureates win, couldn’t they risk being accused of nepotism (maybe cronyism is the right word)? 3 million dollars is a lot of money! John, I am very happy to have found this blog and sincerely hope you will continue blogging in the future. I think many young physicists find it very inspiring to read the thoughts of great physicists they admire, I know I am. Thanks, Heidar! I’m glad you’re enjoying our blog. I’m confident that this year’s prize recipients will be conscientious in selecting future winners. It is characteristic of the strength and creativity of Alexei Kitaev’s work that it can be praised for many reasons, and so I will try to contribute a fresh appreciation. (1) We discover that scalable quantum computing is exceeding difficult to achieve, due to a “1/f” accumulation of many different noise mechanisms (this AFAICT is the world in which we find ourselves at present). (2) After a couple of decades of creative work (both theoretical and experimental) our understanding of these (many) noise mechanisms naturalizes into Kalai-style theorems that suggest quantum computing is infeasible even in principle. This world is utopian because naturality of understanding is (arguably) an essential element of any scientific utopia. (3) Then after several more decades of work (both theoretical and experimental) our understanding of quantum dynamics evolves to the point that we appreciate that the state-space of nature is only approximately a Hilbert space, such that the infeasibility of scalable quantum computing is baked-in to the dynamics of nature. We can regard this final world as “utopian” largely in consequence of Kitaev’s insights relating to dissipation and transport, e.g. Faro, Ioffe, and Kitaev Dissipationless dynamics of randomly coupled spins at high temperatures (2011). This world is “utopian” for pragmatic reasons too: in that a world in which humans understand dissipation and transport as deeply as nature permits, is a world in which human-designed technologies are made as efficient, sensitive, and powerful as nature permits. Hopefully this world is utopian in-practice as well as in-principle, because otherwise an overheating, research-poor planet with ~10^10 people on it, is a mighty sobering prospect to contemplate. The point of this little essay is there there is *no* doubt that Kitaev’s work is exceedingly strong … what is *less* obvious (at present) is which elements of Kitaev’s work will be most appreciated by future generations. Yet perhaps no scientist ever knows that. Are there QC implementations for which the dominant type of noise is 1/f? Also, this paper suggests that it is easy to suppress using dynamical decoupling. I’d be interested in hearing what experimentalists think about this. Thank you for telling us such an interesting story! I like it a lot. I only realized the existence of this blog today from Ann’s email. I heard the news about Alexei’s award from Chinese media report. Congratulation to Alexei. I am glad that Alexei can finally “pay out the mortgage”. Even now I still couldn’t believe that I spent one year in Caltech, and wrote a paper with Alexei! Interesting post, sir. Dr. Kitaev deserve the honor. His work on resilient quantum systems, which can survive even in certain noisy environs, is a contribution to QI that has opened up avenues for others. I look forward to learning more from such posts, sir.